Yesterday, my good buddy Matt Pittman sent me his audition tape for Season 5 of BBQ Pitmasters. Matt's a Texan (Waxahachie), knows how to smoke meat, has a great personality, and is just an all-around good dude, so I hope the show selects him. I'm not a competition guy, but I'm a Matt Pittman guy (not least b/c he, too, is an Alabama Crimson Tide fan), so I want to share it with y'all. Check out Matt's @MeatChurch on Twitter! Final la Barbecue Gameday Giveaway of the season! This season's final la Barbecue Gameday Giveaway is today's Alamo Bowl in San Antonio: Texas vs. Oregon (5:45 PM Central). Closest prediction gets a free BBQ sandwich & side item from la Barbecue. To be eligible to win, I need the following predictions: (1) winner, (2) final score, & (2) total combined yards [in case we need a tiebreaker]. You can submit your prediction as a comment below this post, as a Facebook comment, via Twitter, or via email. Your prediction must be received by kickoff (2:30 PM Central). Good luck! HUGE THANKS to la Barbecue, for their generosity all season. Without the generosity of BBQ joints like la Barbecue, we wouldn't have the privilege of giving away food & other prizes to our readers. Thank you, la Barbecue! I received an email yesterday asking about destinations in Texas for great steaks. It got me thinking about how some Texas BBQ joints double as steakhouses. For example, in Salado, you'll find Johnny's Steaks & Bar-Be-Que. In Killeen, Texas BBQ & Steakhouse. In San Benito, Longhorn Cattle Company Barbeque & Steak Restaurant. Or how about Gabby's in Houston or J. Cody's Steaks & BBQ in Bryan/College Station? You get the point. Today, I'm interested to hear your favorite BBQ/steak joint, and I'd also like to create a list of all the joints in Texas that pull double duty. So, if you know of a place, send me the name and town, and I'll add it to the list! Lubbock is the 11th-biggest city in Texas, but I asked about the best BBQ there back in October. So, continuing down our list, #12 is Garland, a city of almost a quarter million. Which of Garland's BBQ joints is the best? 89. 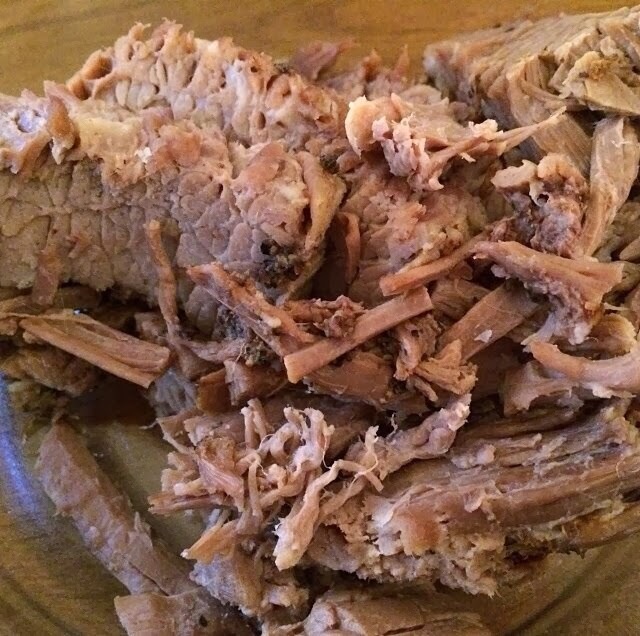 Jim's Pit Bar-B-Q (Reddick, Florida) - "Texas Style Brisket"
Hat tip to @TxLnghrnJen & @compubryan for posting about this joint last night on Twitter. Exterior picture courtesy of @compubryan. 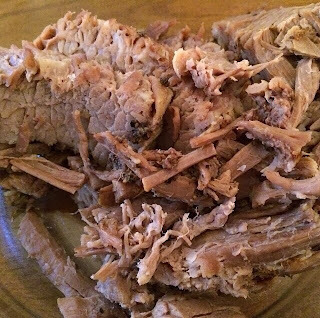 Brisket picture courtesy of @TxLnghrnJen. What's the best BBQ truck/trailer in Houston? Austin is dotted with BBQ food trucks/trailers; and, to be honest, when I think of BBQ trucks, I think of Austin. But I live in Austin, so that's not too surprising. But Houston Metro has its share of BBQ trucks/trailers, as well. 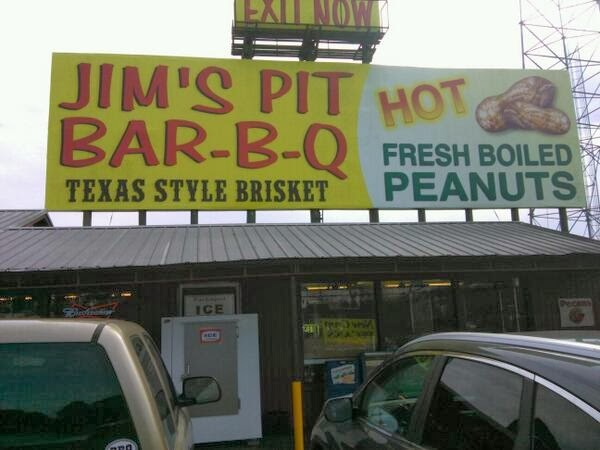 Of all the non-B&M BBQ joints in The greater Houston area, which one is the best? What's the best BBQ in Laredo? I doubt many, if any, think of BBQ when they think of Laredo, Texas. I had good food on my first and only visit to Laredo but wasn't seeking BBQ on the trip. But they have some. Of the BBQ joints in Texas' 10th-most-populous town, which is the best? 88. 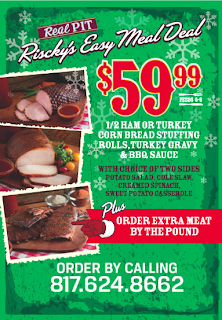 Hickory River Smokehouse (multiple locations in Ohio & Illinois) - "Real Texas-style barbecue. There's nothing better. And no better place to get it than Hickory River Smokehouse. Every cut of beef brisket, pork shoulder, turkey breast, pork loin and on-the-bone chicken are carefully selected and hand-rubbed with our signature spice blend. Then, we infuse them with real hickory smoke for our juicy, award-winning Texas flavor. It's all served-up with our own special-recipe sauce and our famous sides. FOR A TASTE AS BIG AS TEXAS." What's more Texan: BBQ or chili? Back in April, when I didn't know otherwise, I asked readers whether BBQ is the official food of Texas. 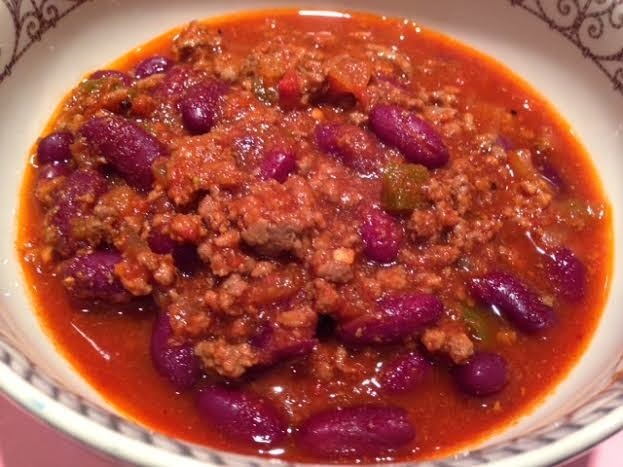 I found out later that day via Twitter that Texas, indeed, has an official dish: chili. The past couple of weeks, a nice little debate has popped up about whether brisket should replace chili as Texas' official dish. Well, ribs aren't brisket, but last night, I had chili and pork ribs for dinner (And, yes, I know: Texas chili shouldn't have beans. I'm not from Texas!). Seems appropriate, then, to renew the discussion: What's more Texan: BBQ or chili? Which Texas BBQ joint has the best merchandise? Since it's holiday time, I'm curious what your thoughts are on BBQ-joint merchandise. Specifically, which Texas BBQ joint has the best swag? If you were going to give t-shirts and what not as gifts, from which Texas BBQ joint would you purchase? Continuing down the list of the largest Texas cities (by population), #9 on the list is Plano. Speaking of which, lots of people I know from Plano say they're from Dallas. I'd buy that if Plano weren't the 9th-biggest city in the state. You're from Plano. Own it! Anyway, which Plano BBQ joint is the best? I was out of town the day of this year's Texas Monthly BBQ Festival, but Man Uppers Brad and Todd attended. Here are some pics of them kicking it with Aaron Franklin (Franklin Barbecue), Daniel Vaughn (Texas Monthly), & brisket (unidentified cow). More pics from the festival to come. Best BBQ in Corpus Christi? Continuing down the list of the largest Texas cities (by population), #8 on the list is Corpus Christi, a town of more than 310K people. Of all the BBQ spots in the "Sparkling City by the Sea," which one is the best? Cowboy Joe's BBQ sauces added to January 25 tour! On January 25, we're heading to Lexington, Taylor, & Georgetown for our 1st public Texas Q Tours trip of 2014. The van sold out, so we are going to open up 1 more. The trip is all-inclusive, and now we are adding even more value: Each person on the trip will take home 2 bottles (1 original, 1 spicy) of Cowboy Joe's Pit & Grilling Sauce! Both of these BBQ sauces placed in the People's Choice Contest Top 10 at this year's Gettin' Sauced! At the 2012 Gettin' Sauced!, Cowboy Joe's won the Vinegar (Mild) category of the Bottled Contest AND won the Overall Category of the Bottled Contest! Cowboy Joe's is based right here in Austin, & they will be on the trip, so you will have the opportunity to meet them & chat. Join us on the trip! Speaking of Cowboy Joe's, they are the first vendor in the 2014 lineup of All-Star Sauces! They'll be shipping 2 bottles of sauce (original, spicy) to each All-Star Sauces customer. The deadline to receive the January shipment has passed, but you can still nab Cowboy Joe's February shipment by ordering by January 15! 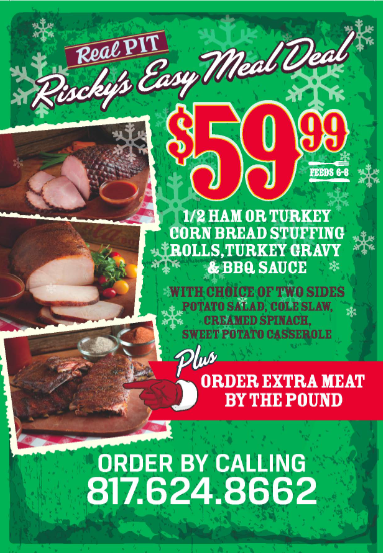 Texas BBQ Giveaway: Riscky's Barbeque's "Easy Meal Deal"
Riscky's Barbeque, a Fort Worth Stockyards joint that has been serving customers for 86 years, has donated to us their "Easy Meal Deal." Priced at $59.99, the "Easy Meal Deal" includes a half ham or turkey, cornbread stuffing, rolls, turkey gravy, BBQ sauce, & choice of 2 sides (potato salad, cole slaw, creamed spinach, sweet-potato casserole). A hearty way to ring in the holidays! To learn more about Riscky's, check them out online, on Facebook, & on Twitter. Year 2 of All-Star Sauces!!! The new year is almost here, and we have an entirely new lineup of BBQ sauces for our 2nd year of All-Star Sauces! Just as it was this year, next year's program will consist of 6 BBQ-sauce vendors, each of which will ship 2 sauces per program customer. If you don't order in time to receive the first order, you're not out of luck, b/c each vendor will ship 2 separate shipments. For example, TODAY is the deadline to order the January 2014 shipment. If you don't order by today but still want the sauces from the January vendor, you can order by January 15 and receive that same vendor's February shipment. March/April is the 2nd vendor. May/June is the 3rd vendor. July/August is the 4th vendor. September/October is the 5th vendor. November/December is the 6th & final vendor. There are 3 order options: single shipment (1 shipment: 2 bottles), half year (3 shipments: 6 bottles), or full year (6 shipments: 12 bottles). If you want any single shipment, just order by the 15th day of the month before the particular shipment. For example, if you want sauces from the May/June vendor, then either order by April 15 or May 15. If you order the half year or the full year, then your shipments will come every other month. For example, if you order the half-year membership by today, you will receive the January, March, & May shipments. If you miss today's deadline and still want the January/February vendor's sauces, then your half-year membership will ship sauces to you in February, April, & June. Got it? If not, check out our FAQs. So, hop on, & let us send award-winning BBQ sauces to your door. ORDER TODAY for yourself and/or friends/family! More of Brad's pictures from our last Texas Q Tours visit to Cranky Frank's (Fredericksburg, TX): One of our favorites, Colby, checking out the smokers! Serious Eats: "Four Hours for Barbecue: the Psychology of Waiting in Line for Food"
But wait. There's more! If you email me an entry and include in your email the Opie's (unofficial, meaning as determined by me!) slogan, I'll throw in an extra entry. So, enter all 4 ways AND include the (unofficial) slogan in your email to me, and you have 5 entries! If you don't already know the 5-word (unofficial) slogan, you can find it on the homepage of the Opie's website. All entries due by Sunday. The drawing will take place Monday. In the meantime, connect with Opie's via Facebook & Twitter! Back in July, we took a Texas Q Tours group to Cranky Frank's in Fredericksburg. I posted my pics form the visit, but I snagged Brad's memory card, so now I can post his pics. 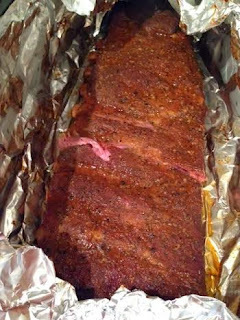 The National Barbecue Association is heading to San Marcos, TX, for their 23rd Annual National Conference & Trade Show. Our friend Daniel Vaughn, Texas Monthly BBQ Editor, will deliver the opening address. Texas' Kent Black & Tim Mikeska will speak, as well. Registration info. Our friend Daniel Vaughn is doing cool things in his new position as BBQ Editor of Texas Monthly. Last week, he published a great Texas BBQ holiday gift guide. If you're looking for apparel, artwork, & more for the smoked-meat lover(s) in your life, this is a great place to start. Included on the list are our Gettin' Sauced! koozies ($3 each, includes shipping) and our Texas Q Tours trips. Thanks for including us on such a great list, DV! Another NFL weekend, another chance to win 2 links of sausage from Lockhart Smokehouse. This week's matchup is: Dallas at Chicago (Monday, 7:30 PM Central). To enter the contest, submit your prediction (winner, score, total yards) via blog comment, Facebook comment, Twitter, or email. You have until kickoff to submit your entry! This week's la Barbecue Gameday Giveaway is Texas at Baylor (today, 2:30 PM Central). Closest prediction gets a free BBQ sandwich & side item from la Barbecue. 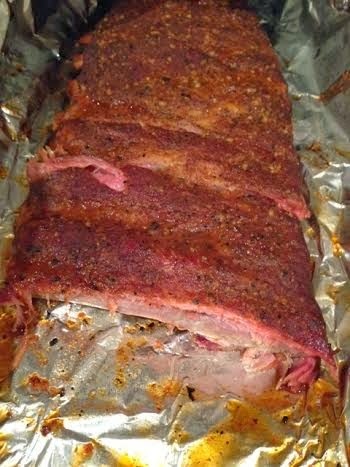 It's always great to see what other BBQ blogs are up to, and I'm thankful we have such an active (and growing) community. 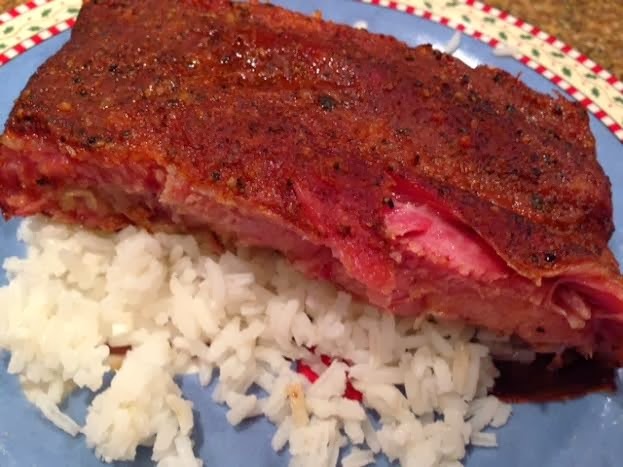 One of these blogs, BBQ Bros, just published its picks for the "Top 10 BBQ Christmas Gifts for 2013." We are so honored to have our All-Star Sauces included on the list. Thank you, BBQ Bros, for including us! All-Star Sauces has just shipped its final shipment of 2013, our inaugural year. And we're so excited about 2014. We have a whole new lineup of 6 award-winning sauce vendors set for Year 2. You can order any single shipment (2 bottles), a half-year membership (6 bottles), or a year membership (12 bottles). Order for yourself and/or friends/family, & let us send award-winning BBQ sauces to your front door! Ticket giveaways for February 22 trip! Yesterday, I announced our second Texas Q Tours trip of 2014. On Saturday, February 22, we're heading to Lockhart and San Marcos (and maybe Kyle). Two BBQ joints, a brewpub, & a dessert shop. Today, to celebrate the start of our 2014 tours, I'm giving away a 1 ticket each to 2 people. After midnight tonight, I will draw 2 names from a hat. Each person whose name is drawn snags a FREE seat on the trip. To get your name in the hat, leave a comment below this post, leave a Facebook comment, tweet us, or email us. Do 1 of these, and your name's in the hat once. Two of these = twice. Three of these = three times. Do all four of these, and you're name's in the hat four times! 2nd public tour of 2014!